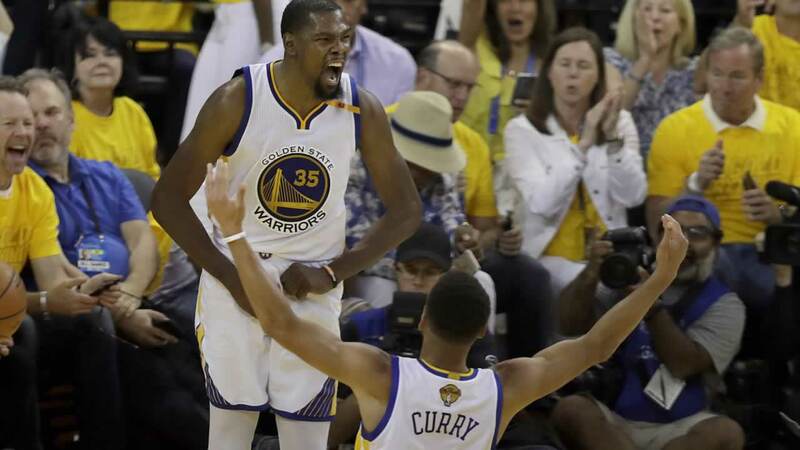 OAKLAND, Calif. -- Stephen Curry dribbled every which way and beat LeBron James to the rim in a move reminiscent of his recent MVP magic, and the Golden State Warriors grabbed a 2-0 lead in the NBA Finals by downing the Cleveland Cavaliers 132-113 Sunday night in coach Steve Kerr's return to the sideline after a six-week absence. "He's been around, the last couple weeks especially, giving us input and giving us what he's got," Curry said of Kerr. "But having him back on the bench means a lot. We love his presence. We love his voice. And we're a full group when he's out here. So that means a lot." James was equally spectacular with his own triple-double of 29 points, 14 assists and 11 rebounds, but yet again didn't get nearly enough help to keep up with Golden State's depth despite Kevin Love's 27 points and 19 from Kyrie Irving. Klay Thompson emerged from a postseason-long shooting funk to score 22 points with four 3-pointers while playing more stellar defense and pulling down seven rebounds for the Warriors, who shot 18 for 43 from deep. "We turned the ball over too much in the first half. But the second half, I think we settled in, tried to play simple and defensively just tried to contest their shots," Durant said. The best-of-seven series now shifts to Cleveland for two games, with Game 3 Wednesday. Kerr returned to the bench to a rousing ovation, waving to the fans while back on the sideline for the first time since Game 2 of the first round against Portland on April 19 because of pain issues stemming from complications after 2015 back surgery. "I'm going to pull out the 'Win one for the Gipper' speech," Kerr joked. "'Knute Rockne, All-American?' Yeah, probably show that. Maybe get a little teary-eyed. Implore them to win it for me because it's not important for them to win it for themselves." He ran circles around James during one masterfully skillful sequence, then drove left through the paint for a right-handed layup over the star's outstretched arm during a signature moment in another rout. James had little help as Love got there late. Now, Golden State is headed to Northeast Ohio needing just two more - yet don't count on anybody considering this series close to done. The Warriors squandered a 3-1 lead to the Cavs a year ago to miss a repeat. It didn't matter in the end. Cavaliers: Tristan Thompson scored his first points of the series on a driving dunk midway through the first quarter. ... Cleveland shot 3 of 20 on 3s in the first half and 8 for 29 total. ... James has won a road game in 29 straight postseason series, so his Cavs must force a Game 5 back in Oakland to keep it going. Warriors: The Warriors had their first 40-point quarter in the Finals since scoring 41 in the first quarter of Game 6 in 1967 against the 76ers. ... Curry's 10 first-quarter free throws matched a playoff record for made shots from the stripe in one period shared with Sarunas Marciulionis, done on April 28, 1992, at Seattle. It also matched Paul Pierce for most in a Finals quarter. ... Thompson played in his 78th postseason game to pass Jeff Mullins for most in franchise history. ... Golden State equaled its four turnovers from Game 1 in the initial 5:12.